I have officially “discarded”: a 100 Pounds from my 5’3” body! This morning as I stood, looking down at the scale it honestly took me a second or longer to process I was under, 155 Pounds! First there was “disbelief”. I honestly thought I was going to see the scale go up again today. “!! !OMG it must be true!!!”….. processed in my head. And as hard as it may be to believe, “I was quiet”. I just took-in the moment. I didn’t scream. There may have been a little giggle from some place, and I’m pretty sure it wasn’t “Boone”, my Springer. Although he appeared happy for me, but then… he’s always pretty happy. What I did next… I ran for my camera! Decided to toss on a t-shirt just in case there was a reflection… I do look better naked, but I won’t be joining a nudist colony any time soon. And took a photo of my SACLE! Go ahead and call me silly – that’s just me! This has been one of the most amazing accomplishments of my life. 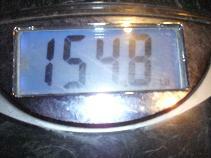 It has taken me nearly all my 55 years on this earth to get my weight dialed in. It’s been a three year journey between Weight Watchers and Take Shape For Life and… so worth it. Thank you for being a part of my success through my blog site! My healthy – “optimal weight” (BMI) is 140 pounds. I’m not done losing just yet, but I can see the light at the end of the tunnel. This entry was posted in Joyce's Blog Notes and tagged Take Shape for Life, Weight Loss, Weight Watches. Bookmark the permalink. you wont beleive it but we almost weigh the exact weight joyce I am at 153.2 today this is so exciting you look great size 8 here we come.